TP-Link 8 Port 10/100 Desktop PoE Switch, 8 x FE ports (4 PoE ports), 57W PoE Power Supply Copyright © 2019 ComXpert International CC - COPYING IS ONLY ALLOWED FOR THE PURPOSE OF SENDING US ENQUIRIES. E&OE. TL-SF1008P is an 8 10/100Mbps ports unmanaged switch that requires no configuration and provides 4 PoE (Power over Ethernet) ports. It can automatically detect and supply power with all IEEE 802.3af compliant Powered Devices (PDs). In this situation, the electrical power is transmitted along with data in one single cable allowing you to expand your network to where there are no power lines or outlets, where you wish to ­fix devices such as APs, IP Cameras or IP Phones, etc. TL-SF1008P has the priority function which will help protect the system when the system power is overloaded. If all PoE PDs power consumption is >= 57W, a priority will be arranged among the PoE ports, then the system will cut o- the power of the lowest-priority port. Priority (port-1=port-2=port-3>port-4): This function will help to ensure the normal operation of the system, it means Port 4 will be cut off when all total PoE PDs power consumption exceed 57W. For an example, Port 1, 2 and 4 is using 15.4W (maximum power for per port is 15.4W); the system power is 46.2W in total. If there is an additional PD inserted to Port 3 with 12W, and then the system will cut off the power of Port 4 because of the overloaded power, this means Port 1, 2 will use 15.4W, and Port3 will use 12W, no power will be supplied to Port 4. TL-SF1008P is easy to install and use. It requires no confi­guration and installation. With desktop design, outstanding performance and quality, the TP-LINK’s TL-SF1008P 8-Port 10/100Mbps Desktop Switch with 4-Port PoE is an ideal choice for expanding your home or office network. Dimensions ( W x D x H ) 6.7 x 3.9 x 1.1 in. 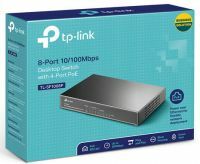 The best price and guaranteed service and backup from official computer suppliers in South Africa for the TP-SF1008P TP-Link 8 Port 10/100 Desktop PoE Switch. The TP-link TP-SF1008P TP-Link 8 Port 10/100 Desktop PoE Switch is available for R965. The product is sold by ComX Computers as new. Prices are valid today 2019-04-24 (before 2019-04-25 , by quote, while stocks last). The product is expected to be in stock, although this is not guaranteed. Find related TP-SF1008P TP-Link 8 Port 10/100 Desktop PoE Switch products in our Power over Ethernet (POE) Category for even more options. Read reviews and find out about TP-SF1008P TP-Link 8 Port 10/100 Desktop PoE Switch. Discounts, specials and cheap prices only at ComX Computers.